That new update is to the Play-Fi App for Windows, and it allows users to watch videos on their PCs or tablets and have that audio synced to a Play-Fi product, such as the lovely and multifunctional Phorus PS5 and PR5. That's right! No tricks or funny business, just streaming the audio out to your speaker with extremely low latency and extremely high quality of service for the best experience. This is a very technical and complex implementation that required a high-level of development from well-educated engineers, and they gave it an equally complex name befitting its nature: "Fast Mode™". 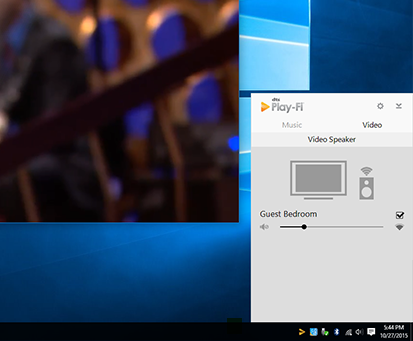 So how do you get video from your Windows PC to your speakers? Easy-Peasy Lemon-Squeezy. First off, this is a Play-Fi HD feature, so if you're just using the free version, go here to get your upgrade license key and enter it into the free app to get Play-Fi HD. If you're an existing Play-Fi HD user, this is a free update, and your app should notify you of the new feature. Then just launch the app; you'll notice it defaults to Music mode, so select the Video tab at the top, and then pick your Play-Fi product (again, can't recommend those Phorus PS5 Speakers enough). Your app should look like the one in the picture above, but instead of "Guest Bedroom", it'll have your speaker name, unless of course that's what you named your speaker. Then just open any media player and play. That's right! Anything! VLC, Media Player Classic, YouTube, PowerDVD, the new Windows 10 official Windows DVD Player, etc., etc. Whatever video you want to watch, play it out to your Play-Fi speaker or receiver products and the audio is beautifully synced to what you see on the screen. Video mode is designed to play synced audio to just one Play-Fi product, so when you want to listen to music throughout your home again on multiple products, simply unpair from the video speaker in the app, and switch back to the Music tab. No need to reconfigure products. That's it! Simple! Exclamation Point! Exclamation Mark for all of our friends in the United Kingdom! Go ahead and download the update to start enjoying your videos with lovely, high-quality Wi-Fi audio that you can only get from Phorus and Play-Fi. Seriously, we're the only ones doing this sort of high quality A/V synchronization over standard Wi-Fi, or any wireless standard. AirPlay won't sync the audio, and Bluetooth won't sound as good nor is as reliable. On top of that the Play-Fi HD app for Windows also lets you do other cool stuff, such as isolate audio from specific existing apps on your PC, so that you only hear audio from that app over Play-Fi and any other sounds--such as system notifications--from your PC system speakers. It really is a total package that you truly can't get anywhere else! That's all for now. Hope you're as excited to try it out as we are releasing it! As always, let us know what you think in the comments. 'Til next time, keep on keepin' on . . .
Any plans to get multiple speakers working with Fast Mode? Stereo mode at least would be pretty decent with this. We’re definitely looking at the possibilities, and doing some experimentation with this. If it’s possible, we’ll put it out for you guys.